Lightly spray 8-inch springform pan with cooking spray. In small bowl, mix Crust ingredients. Press mixture in bottom and 1 inch up side of pan. In large bowl, beat cream cheese with electric mixer on medium speed just until smooth and creamy; do not overbeat. On low speed, gradually beat in 3/4 cup sugar, then beat in eggs, 1 at a time, just until blended. Spoon three-fourths of the cream cheese mixture into pan; spread evenly. Beat pumpkin and pumpkin pie spice into remaining cream cheese mixture with whisk until smooth. Spoon over mixture in pan. Use knife to swirl cream cheese mixtures. Place small ovenproof bowl in bottom of 6- or 7-quart round slow cooker (about 9 inches in diameter). Place ovenproof plate on top of bowl. Set cheesecake on plate. Place triple layer of paper towels on top of slow cooker. Cover with lid to seal. Cook on High heat setting 3 hours without removing lid. Turn slow cooker off and let stand, untouched, 1 hour. 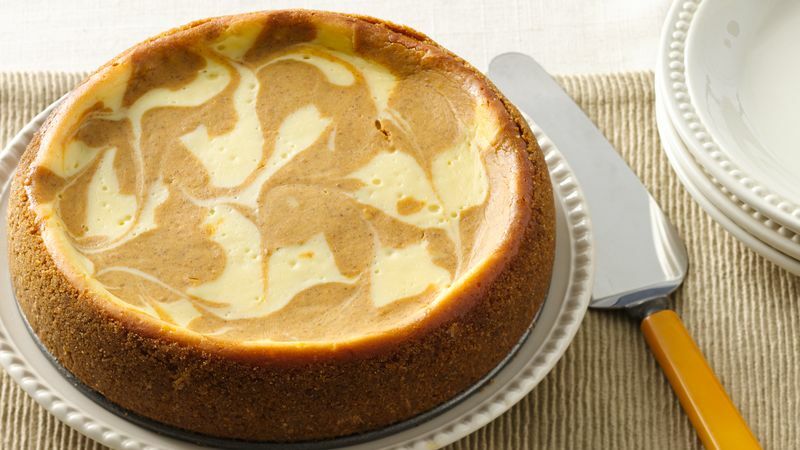 Remove cover, and transfer cheesecake to refrigerator. Refrigerate at least 6 hours before serving, but no longer than 24 hours. Place paper towels directly under the lid. The paper towels serve to lock in moisture and absorb condensation. To bake in the oven, heat oven to 300°F. Prepared crust and cheesecake as directed. Bake 1 hour 10 minutes to 1 hour 20 minutes or until cheesecake is set 1 1/2 inches from edge and center is slightly jiggly. Turn oven off; open oven door at least 4 inches. Let cheesecake remain in oven 30 minutes. Remove cheesecake from oven. Run knife around edge of pan to loosen; cool 30 minutes at room temperature. For easy slicing that produces clean results, dip your knife in water after each cut. Use crushed gingersnap cookies in place of the graham cracker crumbs for an extra-festive treat.